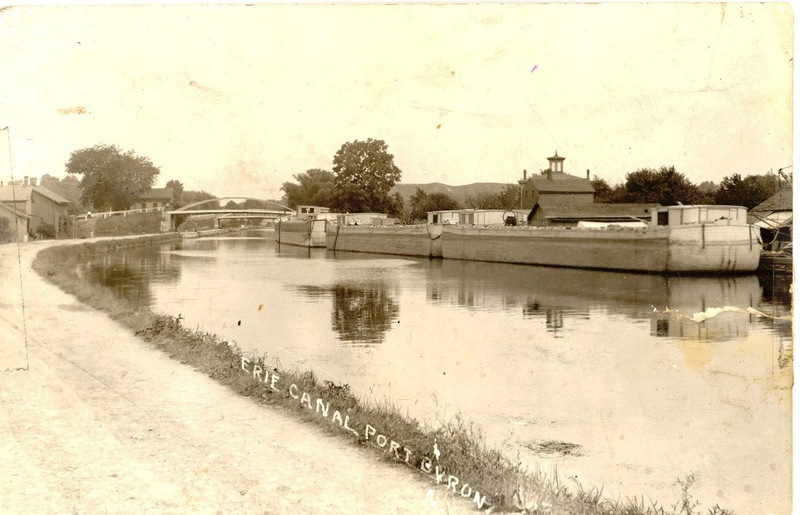 Port Byron and the canal are fairly well documented when it comes to photos and maps. 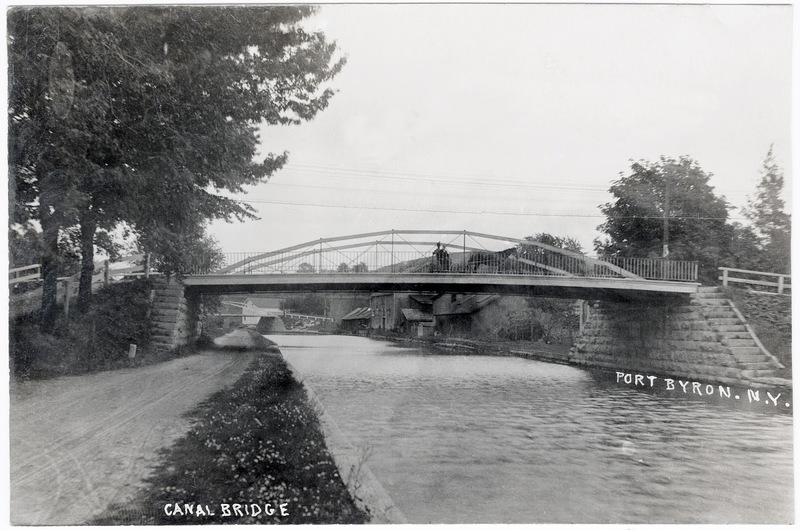 So I thought it would be fun to piece together a walking tour of the canal through Port Byron. Since most of the photos we have are from the early 1900's, we can use the New Century 1904 map of the village as a guide. I have a crop of the canal here. 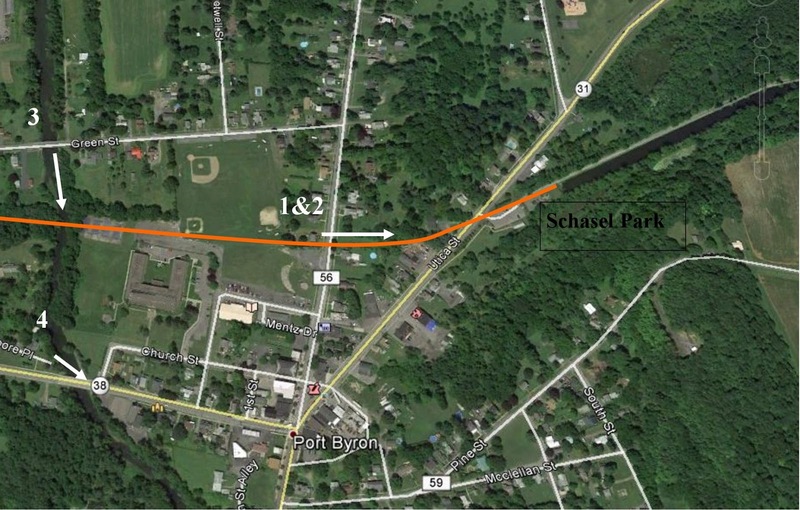 (You can find all these maps on Bill Hecht's map site. Look for the link on the Cayuga County Genweb site.) The 1904 map is likely the least accurate of all the maps we have of the village, but it will do. The right is east, and the left is west. We will start on the east side of the village. 1 &2) Our first two views were taken from the Main Street bridge. The boats are passing under the Utica Street bridge. Actually, it looks like they are taking a break and using the vertical stone walls to pull the boats over and change their teams. The Sterling Salt Company boats are sitting low in the water, which means they are loaded, and that means they are headed east. You can see that the read boat has its rudder lashed up, and that means the boats are a double header. The captain stands and steers from the back of the first boat, using the rear boat as a rudder. The large barn on the right is Caldwells Warehouse. You can see that you can get your Lehigh Valley Coal here. The hill in the background is a great place to take "birdseye views" postcards of the village, which are quite popular with the locals. Well, we can't stand here all day, let's go. Walking west, if we look back, we can see the Main Street bridge we were just standing on. 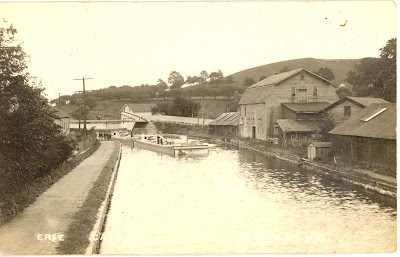 The towpath is on the north side of the canal, and most of the businesses that use the canal are on the south bank. From here, we are going to cross the field and get on Green Street so we can see the aqueduct over the Owasco Outlet. 3) The wooden walls of the aqueduct were recently replaced with iron plates, and we get a good look at the structure from the Green Street highway bridge. 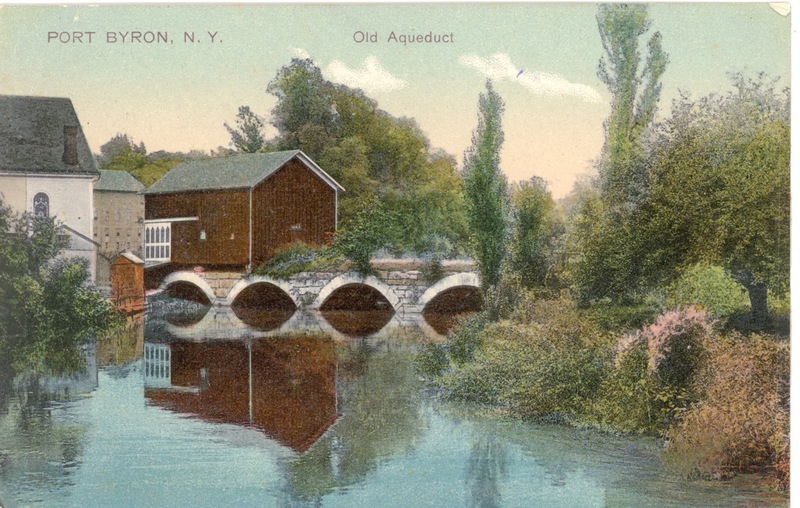 This aqueduct replaced the original aqueduct which we can stop by and see a bit later. We can walk on down to River Street and then up to the towpath again. 5) Once we get to the canal, we will head west and climb up on the Canal Street Bridge. Looking back, we see the River Street bridge and in the distance, we can see the steeple of the Presbyterian Church. 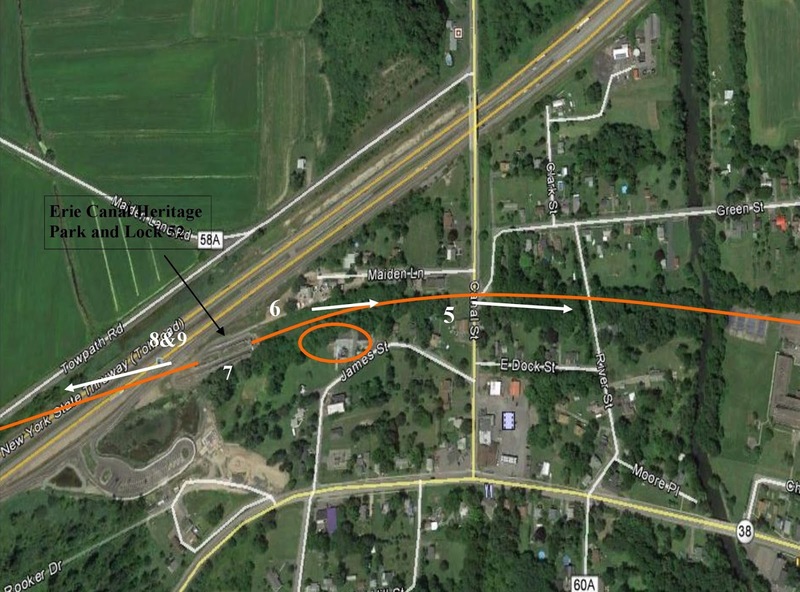 If we look really hard at the canal just past the bridge, we can see where the canal is narrowed by the aqueduct. The boat docked off to the right is a stark reminder that the glory days of the canal are behind her. 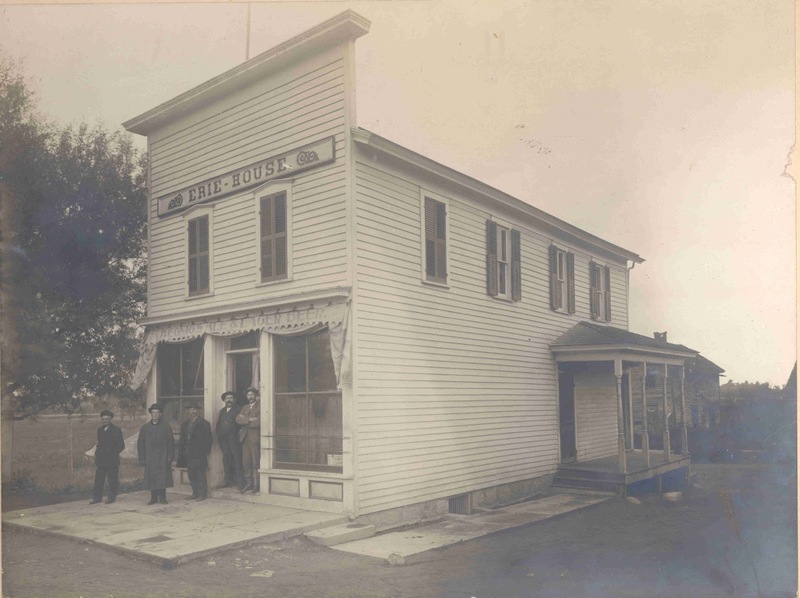 6) There is quite a crowd standing around in front of the tavern. The "drys" have been trying to vote the Town dry, but so far, they haven't won. But they are getting close. (The Town would go mostly dry in 1907 and totally dry in 1909) You got to wonder what would happen to all the bars and taverns if they indeed do win the vote. But for now, it is a good place to watch the traffic and all the activity at the Tanner and Shetler Drydock. 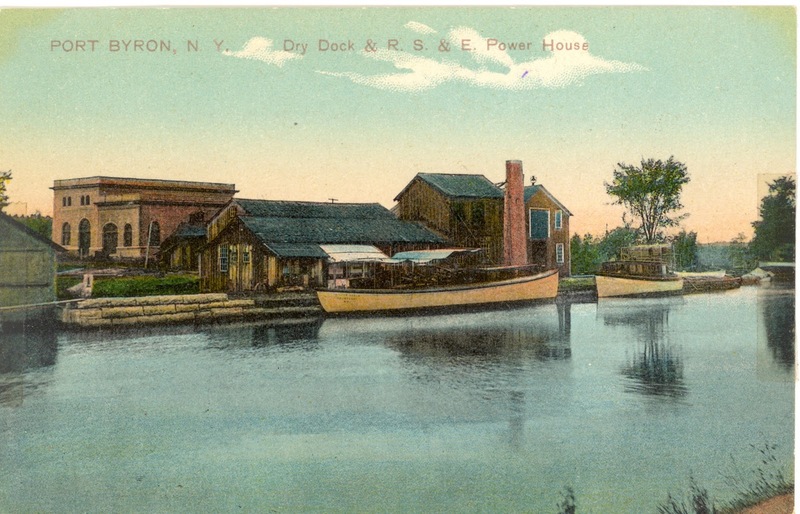 Standing at the Erie House and looking east, we can see the Canal Street bridge and a line of boats waiting at the drydock. You can see the cupola of the Port Byron Free Academy in the back ground. Looking directly across, we see the drydock and in the background, the new power house for the Rochester, Syracuse, and Eastern Interurban. Tanner's is a well known and respected drydock. (The orange circle marks its location) You can't see much from this side of the canal, so when we cross over, we will get a better look. And now we reach Lock 52. 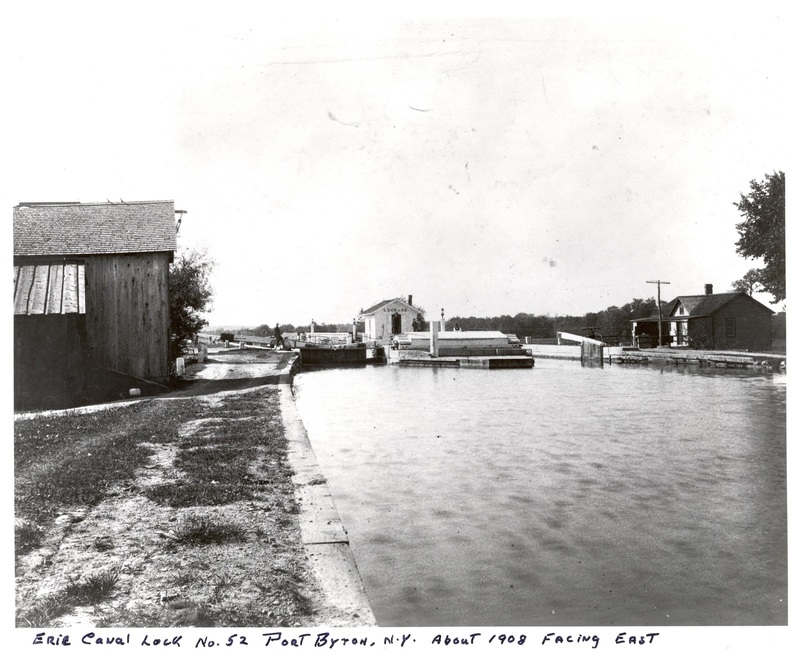 Like all the Erie Canal locks, this is has a side by side arrangement that was built to allow boats to pass heading west and east at the same time. These days, the lock is not as busy. The canal flows west toward the Seneca River, so we approach from the high side of the lock. 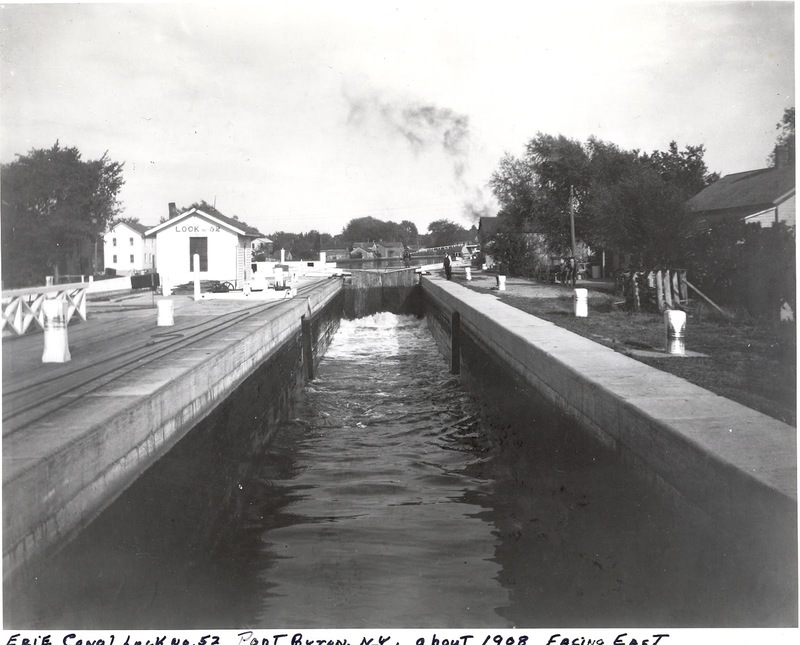 Kern's Store can be seen on the far side of the lock, taking advantage of the time that the boat and its crew are held captive as the boat is raised or lowered. The pole in the front allows the towline to pull on the boat without snagging on the office and other lock structures. 8) If we walk down the towpath to the lower end, we can see lengthened chamber. When the boaters started running two boats with one team (remember the boats we saw on the east side? ), the State doubled the length of the lock so the boaters could pass through without unhooking and hooking the complicated steering mechanism. But they only did one side. So the captains let the lock operator know if they pulling a single or a double. At night, they light one or two lanterns to help out the lock tenders. Let's head up on top of the lock. 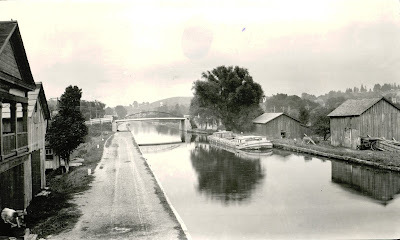 7) Standing on the lock gates, we look east toward the head of the lengthened chamber. The old gate pockets for when the lock was only a single length can seen at the half way point. The cables laying on the left wall are connected to a capstan and that helps to pull the heavy boats into and out of the locks. The mules have quite a job trying to pull a boat through the lock from the tow path, so a clever engineer devised a mechanical capstan to help them out. Since the water of the canal is always flowing, a small water wheel at the head of the lock turns the capstan and that gives the mules a rest. 9) Standing on the lock, we get a nice view west toward Montezuma. From here, the canal passes through the flat mucklands, a great place to grow potatoes, celery, and onions. And as long as we are here, we are able to get a better look at the drydocks. We can see that the drydock is indeed a busy place. 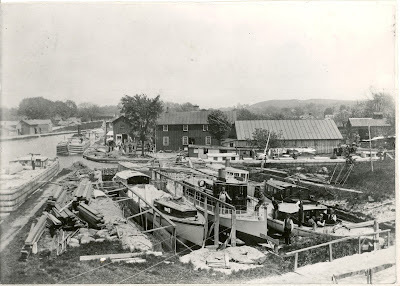 These days, we see a lot of steam powered boats. Many of the old mule boats have been converted and we can see a smoke stack on a couple of the larger boats in the canal. These steam vessels can pull two or three non-powered boats. The old mule quarters on the old boats are now used as living space or removed to increase cargo capacity. The smaller boats travel back and forth between cities and don't go all the way to Albany or Buffalo. So there we go. Our tour has come to an end. Hope you enjoyed it.